As a part of the Global Warming World Tour, the American rock band Aerosmith will perform in Moscow’s Olympiysky on May 24, 2014. The band’s lead singer, Steven Tyler, talked about similarities between Russian and American fans, and his Ukrainian roots. RBTH: You and Aerosmith will perform in Russia in May 2014. What can your fans in the Russian capital expect? 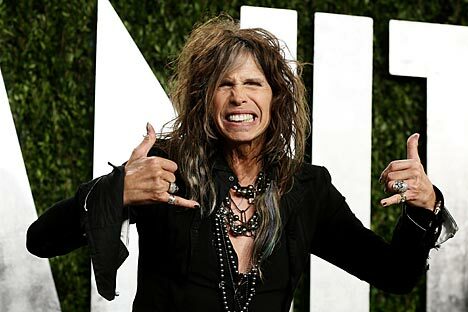 Steven Tyler: We are going to come and shake up Russia a little. I think everyone is waiting for something new – that we all will get dressed in clown costumes with big red noses. No, we will be damn charming and young – we will be ourselves, we will enrage Moscow's authorities and become great friends of the youth. That is rock and roll, and that is what it does. We look forward to the moment when we can do this in Moscow. RBTH: This is not the first visit to Moscow for you. What do you like or maybe not like about Russia? S.T. : I remember the concert in the Olympiysky in 2007. That was cool! I stood on the stage and there were thousands of people in front of me – Russian fans are like the American ones. And I looked at them and thought, “Oh my God, I'm in Russia!” I love Russia. My grandfather was from Ukraine, so I was looking forward to coming here, to give interviews and to tell that my roots and my people are here. I do not know what city my grandfather was from, but I'll find out. RBTH: What about your solo recordings? Is it not enough, what you are now doing with Aerosmith? S.T. : I want to go further and to do something with the strings, maybe in the field of rock, perhaps with a trumpet and a kazoo. I just want to move aside a little and to do something crazy. Just like my last song “Feel So Good Loving You.” This is minimalism, there are not too many guitars, I did not give a big role to the guitar solo; it is just different. RBTH: When can we hear your solo album? S.T. : I’m working on my solo recordings, and I will be working on them in January, February, March, April, and May before our tour. I have written several songs for this album over the last five years. Sometimes I want to work on my own music, but I have never had a chance – every time I write a song for my own album, it is sure to get into an album of Aerosmith. RBTH: You said that you want to work with Paul McCartney and Elton John, right? S.T. : I have talked to Paul about it. Elton wanted us to write something together. I just want to see what is going to come out of all this. RBTH: What can you say about the new album of Aerosmith? We have heard that you are working on it. S.T. : The other day, Joe was standing on the stage and began to play a song, the first chords of “No More No More,” then a random melody. And I began singing, and we got a new song. We are writing new songs all the time, but I do not know what it all is going to lead to. RBTH: So, you mean you’ve written a new song for Aerosmith right on the stage? Will we get to hear it in Moscow? S.T. : Well, I mean he just started playing a melody, and I started singing – and that was all, we did not record it. It just shows how we write songs. I do not think you will hear new songs. We rarely play new songs without recording and releasing them first, to have the copyrights to them. After all, someone in the audience might steal a song. The world has changed; everyone instantly records everything on cell phones at concerts these days. RBTH: What can you say about your style, clothes? You always look a little crazy. S.T. : I like the gypsy style. Maybe it's all because of Ukraine. And it's all from the 1970s. This dagger ring has been in space a couple of times – once in the 1970s with me after I smoked, and later – in the shuttle. Is it ok I say this here? I like a certain style that symbolizes freedom, the gypsy style. I have many charms – charms in my hair, for example. I love all those things.